A sports writer in the Minneapolis Star Tribune looked at the state’s best college football’s prospects from the high school Class of 2016. A highly rated senior linebacker narrowed his choices to Minnesota, Ohio State and Oregon. One day lifting weights in the gym he said: “It just hit me that I wanted to be a Gopher.” And he signed on board. Lent is a good time to affirm “I want to be a Christian.” It’s a good time to look at and deal with our practices of faith whether public or private. You know as well as I do that Lent can be misused and trivialized. For some people Lent means “I am giving up movies, spinach, Swiss chocolate, turnips, and watching Minnesota sports teams.” You get the drift. 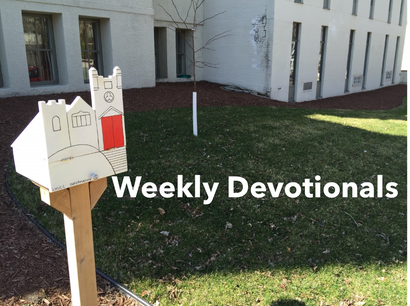 That is not a Lenten challenge – it’s misusing an opportunity to grow as a Christian. Together let’s deal with some tough issues in our lives. At the Ash Wednesday Service beginning Lent we prayed: “God, I have not loved my family with my whole heart.” “I have not been caring to a neighbor.” “Pride, revenge and impatience have plagued me.” “Some of my self-indulgent appetites have run amok.” “I have neglected my prayer life and Sunday morning worship life.” “I have disrespected the environment.” I have not been true to the mind of Christ.” Add your own. Now we are talking about real stuff. But be careful: whatever you name to change in your life in Lent don’t let your list be a guilt trip to beat yourself up with. If you want to start with a small issue - go ahead. If you want to deal with one big issue in your life – then do it. But don’t overwhelm yourself with a laundry list of changes that will overwhelm. And then you don’t do anything. Lent wants to bring out the good in your Christian life. We are talking about what really matters. There is personal work ahead. Begin in a prayerful spirit. Trust God in your changes.